Millstone Grit & Fireclay Co Ltd – Millstone Grit & Fireclay Co was Incorporated in 1966 and took over the common brickworks at Herbertshire, Denny. Worked open cast fireclay pits at Threaprigg and Slamannan Plateau. It was merged with Burn Fireclay Co of Morpeth in 1979 and Herbertshire Brickworks were closed. Alpha – 40 – 42% Alumina. Silica 53.2 %. High Duty Fire Brick. Beta L – For use in Ladles, Tundishes etc. The Works were built at Masonfield near Jawcraig by the Alloa Coal Company. 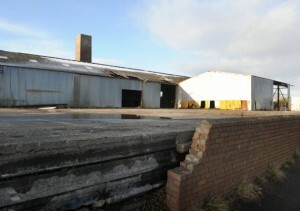 Building started in January 1937 and by June 1937 the kiln was almost ready for use. Production was well under way by September 1937. Raw materials were obtained from the Carbrook Mine at Torwood. The Company stopped the production of common bricks in 1964 and concentrated on refractories, including firebricks, cement, castings, high alumina products, castable products, gun mixes and aluminous jointing cements. Jawcraig Brick Works in Falkirk date from the inter-war years and were closed in the 1970s. During World War II the works were owned by Stirlingshire Brick Works Ltd, but were under care and maintenance and out of production. At the time of their closure in the 1970s, the works were operated by Craigend Refractories Ltd. The works were rebuilt and re-opened in 1987, but mothballed in 1993. This view is looking east along the 18-chambered, oil-fired Belgian kiln which was under a steel-framed cover. The Belgian kiln was patented in 1891 and was developed from the Hoffmann kiln. Both types are brick-built and barrel-arched. Belgian kilns fire at between 1,200 and 1,300ºC. 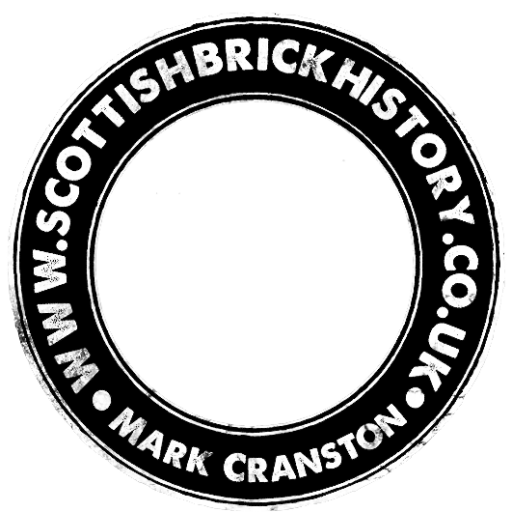 Stirlingshire Brick Company made common bricks and it is thought their brand was the ‘STERLING’ brick. A reference in the Bradley & Craven Machine Order Book suggests that Jawcraig Works were owned and/or operated by Robert Thomson in 1937. 06/02/1937 – Airdrie and Coatbridge Advertiser – Good news was forthcoming last weekend with the announcement that a brickwork would be started at Jawcraig by the Alloa Coal Company. Although it may not employ a large number of men, it is nevertheless a good sign and the benefit will be felt in many quarters. Work on the building of the premises is starting immediately. Hyndshaw Fireclay Mine, Morningside, Newmains, North Lanarkshire. 1896 – Morningside Mine – Morningside Coal Co, Newmains. Coal and Fire Clay mined. John Gray Manager. (Note – SBH – This is believed to be the Hyndshaw Mine) 1920 – Special report on the mineral resources of Great Britain – Chapel Coal Company Limited. Morningside Brickworks, Newmains…. c. 1962 – The mine was started by John G Stein and Co to produce fireclay for the Manuel Works at Whitecross. c. 1981 – Mine closed. 1950 – Mine started by John G Stein and Co. he mined clay was transported underground via the working of the Clayknowes and Milnquarter excavations and straight into the Milnquarter Fireclay Works. 11/1950 – Clay reached. c. 1980 – Mine closed. An open cast fireclay mine worked by the Millstone Grit Fireclay Ltd, Denny. c. 1920 – The mine was opened by John Stein and Co. c. 1928 – The mine was closed.